Surgeons in Louisville, Kentucky have successfully used a 3D-printed model of a heart to study the heart defect of a 14 month-old boy and save his life. According to surgeon Erie Austin, Roland Lian Cung Bawi’s heart didn’t have a single problem it had multiple defects, many of which were difficult to see precisely, even with modern medical imaging. Standard procedure in such cases is to explore and repair the damage during the surgery itself, but Austin had a different idea. Two dimensional scans of the tissue were difficult to analyze but maybe a 3D model would be easier to work with. 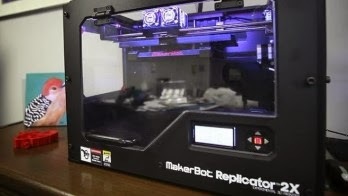 The Kosair Children’s Hospital physician turned to the University of Louisville’s engineering school for help and was able to secure the use of a MakerBot 3D printer. With the 2D CT data turned into a 3D model and blown up to twice the normal size, it was far easier for the medical team to see the problems they were dealing with. Roland was born with a hole in his heart, with a deformed aorta and pulmonary artery. Because the heart must be stopped for surgery, the timing is critical not being able to see an organ until you open the patient up means less time for doctors to find and repair damage. According to Austin, the gamble paid off. What the 3D model showed was that he could make a tunneled pathway between the aortic valve and a ventricle, avoiding multiple surgeries and the need for more cuts. Roland is expected to make a full recovery. Obviously 3D printing cannot become a complete substitute for hands-on investigation. The printed model is only as good as our own ability to see into the body, and while medical imaging has come an incredibly long way in the last few decades, there are still gaps in our ability to model certain systems, particularly inside the brain. 1The ability to build a larger-than-life scale model of a body part quickly and at a reasonable price could make expensive exploratory surgery less necessary and improve the amount of time it takes to repair damage once a problem has been located. Ideally, we’ll see more situations where laproscopic surgery can be used to repair damage as opposed to laparotomy (aka, “opening someone up.”) Laparotomy procedures are typically take much longer to heal from as compared to laproscopic surgery if better models can reduce the need for such invasive procedures, the expense and difficulty of early 3D printing technology will pay for itself.